What’s in your main() header? Possibly a one line description. Legal notice. Sometimes many lines long. That’s it. Now maybe it’s just me, but I find this a bit inadequate. Before I describe what I put in the header for main.c, I should first note my motivation. Anyone that has written code for many years realizes that the whole point of writing code is to allow it to be maintained. The person maintaining the code may be a future version of yourself, but often is some poor sod who gets thrown a bunch of code and told to get on with it. As a result, it is imperative that this future maintainer be told as much as possible about what it is they are maintaining. Now I realize that a lot of what I describe below could be described elsewhere. However, it’s my experience that Word documents and other non source code related documents tend to get lost over time (or perhaps more accurately not packaged with the source code when it is given to someone else), and so by putting this information in main.c, you pretty much guarantee that the maintainer will receive the information. With this as a background, here’s what I think should be in the header for main.c. I typically write somewhere between 10 and 100 lines of text describing the product, what it does, how it does it, what makes it unique and the things about it that make it difficult. Note I’m not describing the code. I always find this a challenge because it forces me to really get to the core of the product. I can sometimes take many hours on this stage, as I try to refine and precis my description to include as much useful information as possible. Who has this sort of time you ask? Well if you think about it, if you can’t write a concise, yet detailed description of the product, surely you aren’t ready to start writing code? Thus if you go through this exercise and find yourself stymied, then you simply shouldn’t be sitting in front of a text editor. Talking of text editors, the next thing you should have is an entry that describes how you have your text editor configured. I’m not interested in getting into a discussion about what your text editor settings should be – I’d just like to know what they are so that I can configure my text editor to match. This is a critical step as there is no bigger time waster than trying to understand code that looks like a disaster because you used tabs with an indentation of 2 and my editor is using an indentation of 4. The text editor is of course part of the larger development environment. While it’s obvious to you what build environment you are using, it isn’t to someone else. Thus if you are using an IDE from Keil then say so. Conversely if you are from the IDE’s are evil camp and instead rely upon makefiles, well make that clear as well. Note the presence of a makefile in the source code directory does not IMHO constitute adequate documentation that this is how you intend the code to be built. Almost every project I look at fails to make it clear what compiler make and version the code was written for. This always blows me away, because I’ve never yet seen an embedded system that doesn’t rely on compiler specific facets for it to successfully compile. Thus you should spell out exactly what compiler you used – even if you don’t think it really matters much. If you are using libraries, particularly ones from a third party, then you should really be spelling this out and of course specifying what version of the library you used. If there are special licensing restrictions on the use of the library, then this isn’t a bad place to mention it either. If you use other tools, particularly code generation tools, then it would be really nice to let the reader know that your code relies upon tool X, version Y. If you are using make rather than an IDE, it would also be nice to let us all know what version of make you used. Many CPUs are configurable via fuse bits of some type (PICs and AVRs are prime examples). These configuration bits usually have a dramatic impact on how the CPU behaves, and so it is critical that you document what fuse bit settings you are assuming. It’s possible to waste many hours debugging a system that in fact has no code problems per se, but rather is simply misconfigured at the fuse bit level. Finally, it would be really nice if you told everyone how to actually make the executable. I’m constantly amazed at the number of projects I see where either the method of building is unclear, or worse, the ‘obvious method’ (e.g. typing make) results in a build failure because prior to e.g. invoking make, it is necessary to run some batch file etc. While I think there’s a lot more project specific information that can go in the header, I think the above is a pretty decent start. I’d be interested in hearing about other information that you put in your main.c header. What does 0x47u mean anyway? In the last couple of years I have had a large number of folks end up on this blog as a result of search terms such as “what does 0X47u mean?” In an effort to make their visit more productive, I’ll explain and also offer some thoughts on the topic. Now in the world of computing, unsigned types don’t seem to crop up much. However in the embedded arena, unsigned integers are extremely common. Indeed IMHO you should use them. For information on doing so, see here. So this brings me to the answer to the question posed in the title – what does 0x47u mean? It means that it is an unsigned hexadecimal constant of value 47 hex = 71 decimal. If the ‘u’ is omitted then it is a signed hexadecimal constant of value 47 hex. You actually have three ways that to satisfy rule 10.6. Here are examples of the three methods. The result is a lot of typing and a mess to read. Don’t do it! Is that 345L or 3451? To really see what I mean, try these examples in a standard text editor. Anyway as a result, I always use upper case ‘L’ to signify a long constant – and thus to be consistent I use an upper case ‘U’ for unsigned. I could of course use ‘uL’ – but that just looks weird to me. Incidentally based upon the code I have looked at over the last decade or so, I’d say that I’m in the minority on this topic, and that more people use the lower case ‘u’. I’d be interested to know what the readers of this blog do – particularly if they have a reason for doing so rather than whim! You know so-and-so. (S)he writes really good code. This code is complete crap. In fact a lot of so called crap code is labeled as such because the author did things differently to the way the reader would have done it. I think it’s important to recognize this before summarily dismissing some code. Notwithstanding this, I all too often find myself saying ‘this code is complete crap’ – because it is! The code started out being pretty good and has degenerated over time because the author hasn’t been allowed the time to perform the necessary refactoring. I think this does explain a lot of the bad code I see. The folks that write crap code are completely oblivious to the fact they are doing it. Indeed it’s only the self aware / self critical types that would even bother to ask themselves the question ‘is my code any good?’ Indeed, the first step to improving ones code is to ask oneself the question – how can I improve my code? My gut feel is that point 4 is most likely the main cause. Now if you are so self-absorbed that you wouldn’t even dream to ask yourself the question ‘do I write crap code?’, then I seriously doubt whether you’d be reading this article. However if you have crossed this hurdle, then how can you determine if the code you are writing is any good? Well I took a stab at this a while back with this article . However some of the commenters pointed out that it’s quite easy to write code that has good metrics – yet is still complete crap. So clearly the code metrics approach is part of the story – but not the entire story. If it’s hard to maintain, it’s crap. Clearly there are all sorts of exceptions and qualifications, but at the end of the day I think this statement pretty much says it all. Thus if you are wondering if you write crap code, just ask yourself the question – how hard is this code to maintain? If you don’t like the answer, then it’s time to make a change. It is well known that standard C language features map horribly on to the architecture of many processors. While the mapping is obvious and appalling for some processors (low end PICs, 8051 spring to mind), it’s still not necessarily great at the 32 bit end of the spectrum where processors without floating point units can be hit hard with C’s floating point promotion rules. While this is all obvious stuff, it’s essentially about what those CPUs are lacking. Where it gets really interesting in the embedded space is when you have a processor that has all sorts of specialized features that are great for embedded systems – but which simply do not map on to the C language view of the world. Some examples will illustrate my point. The C language does of course have support for performing shift operations. However, these are strictly arithmetic shifts. That is when bits get shifted off the end of an integer type, they are simply lost. Logical shifting, sometimes known as rotation, is different in that bits simply get rotated back around (often through the carry bit but not always). Now while arithmetic shifting is great for, well arithmetic operations, there are plenty of occasions in which I find myself wanting to perform a rotation. Now can I write a rotation function in C – sure – but it’s a real pain in the tuches. If you have ever had to design and implement an integer digital filter, I am sure you found yourself yearning for an addition operator that will saturate rather than overflow. [In this form of arithmetic, if the integral type would overflow as the result of an operation, then the processor simply returns the minimum or maximum value as appropriate]. Processors that the designers think might be required to perform digital filtering will have this feature built directly into their instruction sets. By contrast the C language has zero direct support for such operations, which must be coded using nasty checks and masks. Swapping the upper and lower nibbles of a byte is a common operation in cryptography and related fields. As a result many processors include this ever so useful instruction in their instruction sets. While you can of course write C code to do it, it’s horrible looking and grossly inefficient when compared to the built in instruction. Yes I can write C code to achieve the desired functionality. The resultant C code is usually ugly and horribly inefficient when compared to the intrinsic function of the processor. It will often force the compiler to not optimize the enclosing function. It’s really easy to screw it up. It’s banned by most coding standards. Because it’s a compiler intrinsic function, there are no issues with optimization. Similarly because one works with standard variable names, there is no particular likelihood of getting this wrong. Because it looks like a function call, there isn’t normally a problem with coding standards. This then leads to one of the essential quandaries of embedded systems. Is it better to write completely standard (and hence presumably portable) C code, or should one take every advantage of neat features that are offered by your CPU (and if it is any good), your compiler? Porting code from one CPU to another happens rarely. Thus to burden the bulk of systems with this mythical possibility seems weird to me. End users do not care. When was the last time you heard someone extoll the use of standard code in the latest widget? Instead end users care about speed, power and battery life. All things that can come about by having the most efficient code possible. It seems downright rude not to use those features that the CPU designer built in to the CPU just because some purist says I should not. Having said this, I do of course understand completely if you are in the business of selling software components (e.g. an AES library), where using intrinsic / specialized instructions could be a veritable pain. However for the rest of the industry I say use those intrinsic functions! As always, let the debate begin. Configuring hardware – part 1. Some peripherals are stunningly complex. If you have ever configured the ATM controller on a PowerQUICC processor then you know what I mean! The documentation is often poor. See for example just about any LCD controller’s data sheet. The person configuring the hardware (i.e. me in my case) has an incomplete understanding of how the peripheral works. One often has to write the code before the hardware is available for testing. I think I could extend this list a little further – but you get the idea. Anyway, I have struggled with this problem for many years. Now while it is impossible to come up with a methodology that guarantees correct results, I have come up with a system that really seems to make this task easier. In the first part of this series I will address the most elemental task – and that is how to set the requisite bits in the register. By way of example, consider this register definition. 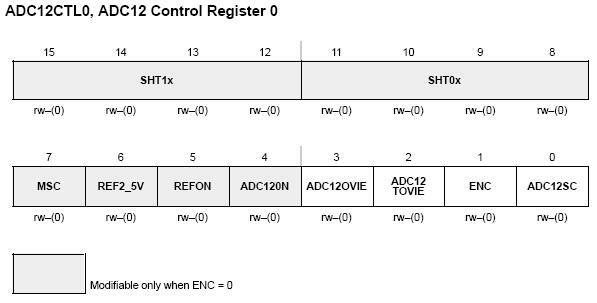 This is a control register for an ADC found in the MSP430 series of microcontrollers. The task at hand is how to write the code to set the desired bits. Now in some ways this is trivial. However if you are serious about your work, then your concern isn’t just setting the correct bits – but doing so in such a manner that it is crystal clear to someone else (normally a future version of yourself) as to what you have done – and why. With this as a premise, let’s look at some of the ways you can tackle this problem. Other than that, I really can’t see any justification for this approach. Even worse than the magic number approach is to attempt to impose a bit field structure on to the register. While on first glance this may be appealing – don’t do it! Now while I think bitfields have their place, I certainly don’t recommend them for mapping on to hardware registers. The reason is that in a nutshell the C standard essentially allows the compiler vendor carte blanche in how they implement them. For a passionate exposition on this topic, see this comment on the aforementioned post. Anyway, this approach is so bad I refuse to give an example of it! However, if you use this approach you will inevitably end up confusing SHT00 and SHT0_0 – with disastrous and very frustrating results. It relies upon the manifest constants being correct / me using the correct manifest constant. You only need to spend a few hours tracking down a bug that ends up being an incorrect #define to know how frustrating this can be. It still doesn’t really address the issue of fields that aren’t set. That is, was it my intention to leave them at zero, or was it an oversight? There is often a mismatch between what the compiler vendor calls a field and what appears in the data sheet. For example, the data sheet shows that the SHT0 field is called SHT0x. However the compiler vendor may choose to simply call this SHT0, or SHT0X etc. Thus I end up fighting compilation errors because of trivial naming mismatches. When debugging, I often end up looking at a window that tells me that ADC12CTL0 bit 6 is set – and I’m stuck trying to determine what that means. (I recognize that some debuggers will symbolically label the bits – however it isn’t universal). It requires me to explicitly set / clear every bit. It is not susceptible to errors in definition / use of #defines. It allows easy interaction with a debugger. I have done away with the various #defines. At the end of the day, the hardware requires that bit 5 be set to turn the reference on. The best way to ensure that bit 5 is set is to explicitly set it. Now this thinking tends to fly in the face of conventional wisdom. However, having adopted this approach I have found it to be less error prone – and a lot easier to debug / maintain. Every bit position is explicitly set or cleared. This forces me to consider every bit in turn and decide what it’s appropriate value should be. The layout is important. By looking down the columns, I can check that I haven’t missed any fields. Just as important, many debuggers present the bit fields of a register as a column just like this. Thus it’s trivial to map what you see in the debugger to what you have written. The value being shifted has a ‘u’ appended to it. This keeps the MISRA folks happy – and it’s a good habit to get into. It can be tedious with a 32 bit register. In the next part of this article I will describe how one can extend this technique to make configuring peripherals a lot less painful.